Although the Glomeromycota comprise a group of fungi virtually unknown to the broad public, they are essential for terrestrial ecosystem function. Members of this group are mutualistic symbionts that form arbuscular mycorrhizal (AM) associations intracellularly within the roots of the vast majority of herbaceous plants and tropical trees. This type of symbiosis is termed mutualistic because the fungus and host plant both benefit from this intimate association. The fungal symbiont receives carbohydrates from the plant in exchange for functioning as an extended root system, thereby dramatically improving mineral uptake by the plant roots. Although there are various types of mycorrhizas, involving different fungal and plant symbionts, the arbuscular mycorrhiza type is the most widespread. The phylum Glomeromycota currently comprises approximately 150 described species distributed among ten genera, most of which are defined primarily by spore morphology. Recently, DNA sequences have also been used to circumscribe taxa. As mutualistic symbionts, arbuscular mycorrhizal fungi are able to grow within plant roots without causing disease symptoms. They are obligate symbionts because no one has been successful in growing glomeromycotan fungi separately from their symbiotic plant host. Once they invade the root, they usually form tree-shaped structures called arbuscules that often fill the root cells. Because the cell walls of both symbionts are greatly reduced in thickness along the surface of the arbuscule branches, both symbiotic partners are brought into very close contact. This highly specialized symbiosis was previously known as "vesicular-arbuscular mycorrhiza" (VAM) because some glomeromycotan fungi also form storage organs termed vesicles within the root cells. Glomeromycotan fungi produce relatively large (40-800 µm) spores with layered walls, containing several hundreds to thousands of nuclei (Bécard and Pfeffer, 1993). Spores may be formed singly, in clusters or in morphologically distinct "fruitbodies" called sporocarps (Morton, 1988). Similar to most Zygomycota, the cellular filaments (hyphae) of glomeromycotan fungi lack regular cross walls (septae) that are one of the hallmarks of the fungal phyla Basidiomycota and Ascomycota. There is no evidence that the Glomeromycota reproduce sexually. Studies using molecular marker genes have detected no genetic recombination or only low levels (Kuhn et al., 2001). Therefore it is generally assumed that the spores are formed asexually. There are conflicting reports on the question whether the nuclei in the mycelium and spores of one organism are genetically identical or not (Kuhn et al., 2001, Pawlowska and Taylor, 2004; Hijri and Sanders, 2005). The presence of multiple, slightly differing variants of the nuclear-encoded ribosomal RNA genes in single spores may or may not be due to this possible nuclear heterogeneity. Under favorable conditions glomeromycotan spores germinate, form appressoria on host roots and establish a new mycorrhizal symbiosis. New spores may be formed on the mycelium either within or outside the root. In addition to propagation by spores, many species of Glomeromycota can colonize host plants from hyphal fragments in the soil or directly from symbionts that inhabit the roots of a neighboring plant. Given that they are obligate symbionts, if no host root is found by the germinating hypha of a spore, growth ceases after some time, and the cytoplasm may be retracted within the spore. Because they cannot be cultured axenically, these fungi are propagated primarily on the host plant in pot cultures grown in a greenhouse. The spores produced in open pot cultures are not sterile and therefore harbor a wide variety of bacteria and other fungi (Bianciotto et al., 2000; Hijri et al., 2002). Cultures can be started using field soil containing spores or hyphae, from a number of purified spores that morphologically appear to represent a single species, or from a single spore. 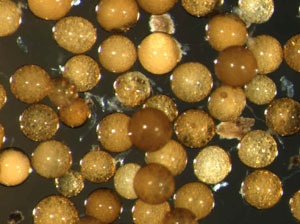 Glomeromycotan spores can be concentrated by wet-sieving methods or by centrifugation techniques. In addition to propagation via pot cultures, a number of glomeromycotan species can be grown in root organ cultures, i.e. on the roots of a plant growing on a sterile nutrient medium in a petri dish (Fortin et al., 2002). The fungal biomass produced in root organ cultures usually does not contain other microorganisms, and this is therefore the method of choice for certain molecular biological experiments. Figure 1: Spores of Scutellospora castanea (isolate BEG1, photo © Annemarie Brennwald). Spore diameter approximately 220 µm. Associations between plant roots and fungi (mycorrhizas) are ubiquitous. The great majority of land plants are host for some type of mycorrhiza. Members of most plant families form AM (Smith and Read, 1997). Other types of mycorrhiza are formed with fungi from the phyla Asco- or Basidiomycota: ectomycorrhiza of trees and shrubs, ericoid mycorrhiza of Ericales, orchid mycorrhiza, and some others. Only a few plant families are regarded as non-mycorrhizal, among them the Brassicaceae (e.g. cabbage, Arabidopsis), Caryophyllaceae (e.g. carnation) and Chenopodiaceae (e.g. spinach). As most crops are hosts for AM, this association is potentially an important resource for agriculture (e. g. see Sieverding, 1991). Positive effects of the arbuscular mycorrhiza on plant growth, nutrient uptake and disease resistance have often been reported. These effects are relatively easy to demonstrate in comparison to sterilized soil which rarely is found under field conditions. Although the fungal diversity in temperate agricultural soils was shown to be low compared to natural field sites (Helgason et al., 1998), there is almost always an indigenous fungal community the introduced AM fungi have to compete with. AM has been reported to improve the uptake of different mineral nutrients. However, phosphate has been in the focus because it can be a limiting factor for plant growth due to its immobility in the soil. The fine hyphal network is superior to the relatively thick roots and root hairs in accessing phosphate in the soil. On the other hand, high available phosphate concentrations often seem to induce a limitiation of fungal colonization levels by the plants. Host specificity of AM appears to be be very low (Smith and Read, 1997) because many species have been shown to colonize a wide range of host plants in the greenhouse. Interestingly, plants are typically colonized by a mixture of AM fungal species, often within the same root (e.g. Helgason et al., 1999). Nevertheless, favorable and less favorable combinations of plant-fungal symbionts have been reported. AM fungi have also been shown to exert a specific influence on the species composition of plant communities (van der Heijden et al., 1998). Field studies using molecular identification methods have demonstrated that distinct fungal communities are associated with different hosts (Vandenkoornhuyse et al., 2002). Although the symbiosis is generally thought to be beneficial, under certain conditions the balance between the symbionts may be disturbed. There is evidence that a fungal symbiont may decrease plant growth (Hendrix et al., 1992). Conversely, certain non-photosynthetic plants may cheat the fungus by obtaining all their nutrients from them, including carbohydrates (Bidartondo et al., 2002). The cross-talk between symbionts and the genes involved in the establishment and maintenance of the symbiosis have been subject of intensive research efforts (e.g. see Gianinazzi-Pearson and Brechenmacher, 2004). Although the mycorrhizal status of many species placed in this group has in fact not been demonstrated, only one fungus in the Glomeromycota is currently known which forms a different type of symbiosis: Geosiphon pyriformis. 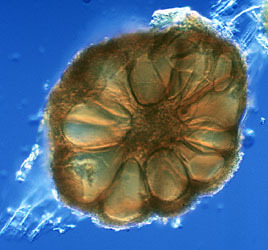 This fungus produces bladders that harbor symbiotic cyanobacteria (Schüßler et al., 1994, 1996). Nevertheless, molecular phylogenetic analysis has shown that Geosiphon is a member of the Glomeromycota (Schüßler et al., 2001). At the present time, the phylogeny presented here (Figure 2) is based entirely on analyses of the small subunit RNA gene. Although additional genes have begun to be sequenced from some taxa (e.g. Helgason et al., 2003; Corradi et al., 2004), phylogenetic hypotheses based on multilocus DNA sequence data have yet to be incorporated into their classification. Figure 2: Phylogenetic tree of Glomeromycota lineages based on analyses of ribosomal small subunit sequences. Glomus subgroups as defined by Schwarzott et al. (2001). rDNA phylogenies have shown that the genus Glomus is several times polyphyletic (Redecker et al., 2000b; Schwarzott et al., 2001). Species forming Glomus-like spores can be found in six different lineages within the Glomeromycota. The simple morphology of the spores apparently has concealed the large genetic variation within the polyphyletic genus as previously defined. Paraglomus appears to be the earliest-diverging glomeromycotan lineage in rDNA phylogenies, although sometimes receiving relatively weak bootstrap support. The separation of Pacispora and the Diversispora clade from other "Glomus" lineages" is well-supported by rDNA data. Glomus groups A and B (as defined by Schwarzott et al., 2001) are exemplified by the well-known species Glomus mosseae and Glomus claroideum, respectively. The two groups are genetically relatively distant but still form a monophyletic group in rDNA phylogenetic trees. The formation of a "sporiferous saccule" was once thought to be characteristic for the Acaulosporaceae (Acaulospora and Entrophospora), but now is known to occur in at least one additional lineage, namely Archaeospora. The Gigasporaceae (Scutellospora and Gigaspora) are distinguished by the formation of their spores on a "bulbous suspensor" and are well-supported by molecular data. Gigasporaceae and Acaulosporaceae form a clade in most rDNA phylogenies, which is in conflict with previous morphology-based analyses that placed Glomus and Acaulosporaceae together (Morton and Benny, 1990). 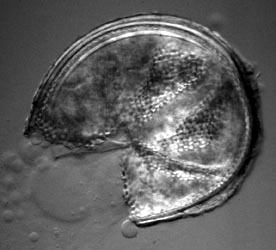 The "Glomales" were previously placed in the Zygomycota, but the following evidence indicates that they form a monophyletic group distinct from other Zygomycotan lineages: their symbiotic habit, the apparent lack of zygospores and the rDNA phylogeny. Based on this evidence, Schüßler et al. (2001) erected the phylum Glomeromycota. These authors also corrected the previously used, grammatically incorrect ordinal name "Glomales" to "Glomerales". In phylogenetic trees based on rDNA, the Glomeromycota are the sister group to Asco- and Basidiomycota. Since molecular phylogenetic methods have been used to elucidate the phylogenetic relationships among these fungi, their classification has been in a rapid transition. Molecular field studies have also revealed a large number of putative new species (e.g. Vandenkoornhuyse et al., 2002), suggesting that the 150 morphologically-defined species may vastly underestimate species diversity. Traditionally, glomeromycotan taxonomy has been based on the morphology of the spores. The way the spore is formed on the hypha ("mode of spore formation") has been important to circumscribe genera and families, and the layer structure of the spore wall to distinguish species (Walker, 1983; Morton, 1988). Some species have a richly ornamented spore surface (see Figure 3). Figure 3: Spore of Archaeospora leptoticha (isolate NC176) cracked open under a microscope cover slide. The spore wall is multilayered with a richly ornamented surface. Photo © Dirk Redecker, isolate courtesy of J. B. Morton at INVAM. 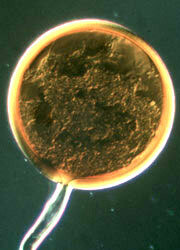 Uncracked spore diameter approximately 200 µm. Glomeromycotan taxonomy is relatively young. Prior to 1974, most AM fungi were in the genus Endogone. However, in 1974 Gerdemann and Trappe (1974) removed the AM fungi from Endogone and placed them in four separate genera: Glomus, Sclerocystis, Acaulospora and Gigaspora. Unlike the putatively asexual members of the Glomeromycota, Endogone species reproduce sexually via zygospores, indicating their phylogenetic link with the phylum Zygomycota. Phylogenetic analysis of the nuclear small subunit ribosomal RNA strongly suggests that Endogone (Endogonales) and the Glomeromycota do not form a clade (Gehrig et al., 1996). The order Glomales was erected by Morton and Benny (1990) to contain all AM fungi. At that time two more genera, Scutellospora and Entrophospora, had been established by other authors and three families (Glomaceae, Gigasporaceae and Acaulosporaceae) were recognized. These families were characterized by the mode of spore formation and were initially supported by molecular data (Simon et al., 1993). Since then, it has become clear, however, that the mode of spore formation is not a useful diagnostic feature for some genera. Spores of the Glomus and Acaulospora types were reported to be produced by several distinct, deeply divergent lineages (Redecker et al., 2000a). Subsequently, they were described as two new genera Archaeospora and Paraglomus (Morton and Redecker, 2001) and placed in separate families. Because some species in Archaeospora were even dimorphic, members of this genus were classified originally in separate families (Morton et al., 1997). Molecular phylogenetic analysis has also shown that species which form complex sporocarps formerly placed in the genus Sclerocystis (Figure 4) are actually phylogenetically nested within well-characterized Glomus species with simple spores (Redecker et al., 2000b). 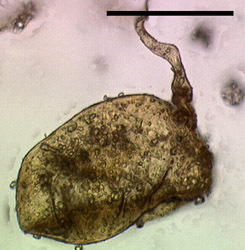 Figure 4: Section of a sporocarp of Glomus sinuosum (isolate MD126, formerly Sclerocystis sinuosa). Spores are arranged around a center of interwoven hyphae and covered by a "peridium". Photo © Dirk Redecker, isolate courtesy of J. B. Morton at INVAM. Sporocarp diameter approximately 250 µm. A new genus Pacispora was erected by Oehl and Sieverding (2004), comprising some former Glomus species. The genus name Gerdemannia published for the same fungal group a few weeks later (Walker et al., 2004), is a synonym of Pacispora, and an illegitimate name based on the publication date. The spores of Pacispora have characteristics intermediate between Glomus and the Gigasporaceae. Another emerging genus split off from Glomus (sensu Morton and Benny, 1990) is Diversispora. Only one Glomus species has been formally renamed so far (Walker and Schüßler, 2004), mainly based on ribosomal small subunit sequence signatures. The Glomeromycota are a very old group with an estimated origin of at least 600 to 620 million years ago. Their evolutionary origin, therefore, predates the split of the Ascomycota and Basidiomycota (Berbee and Taylor, 2000; Redecker et al., 2000b). Spores and hyphae of glomalean fungi were discovered in 460 million year old rocks from the Ordovician (Redecker et al., 2000b), thus they are among the oldest recognized fungal fossils to date. The oldest arbuscules found thus far were in early land plants from the Devonian (400 million years ago; Remy et al., 1994). These findings show that the Glomeromycota were present during the very earliest stages of the colonization of land by plants, supporting the hypothesis that they were instrumental in this process (Pirozynski and Malloch, 1975, Simon et al., 1993; Blackwell, 2000). Today AM fungi are found in most major lineages of land plants. Although this symbiosis apparently was lost or replaced by other mycorrhizae several times during the evolution of terrestrial plant life, it represents the archetypal mycorrhiza. Becard, G., Pfeffer, P.E., 1993. Status of Nuclear Division in Arbuscular Mycorrhizal Fungi During In-Vitro Development. Protoplasma 174, 62-68. Berbee, M.L., Taylor, J.W., 2000, Fungal molecular evolution: gene trees and geologic time, In: McLaughlin, D.J., McLaughlin, E.G., Lemke, P.A. (Eds.) The Mycota. Springer Verlag, New York, pp. 229-246. Bianciotto, V., Lumini, E., Lanfranco, L., Minerdi, D., Bonfante, P., Perotto, S., 2000. Detection and identification of bacterial endosymbionts in arbuscular mycorrhizal fungi belonging to the family Gigasporaceae. Applied and Environmental Microbiology 66, 4503-4509. Bidartondo, M.I., Redecker, D., Hijri, I., Wiemken, A., Bruns, T.D., Domínguez, L., Sérsic, A., Leake, J.R., Read, D.J., 2002. Epiparasitic plants specialized on arbuscular mycorrhizal fungi. Nature 419, 389-393. Blackwell, M., 2000. Terrestrial life - Fungal from the start? Science 289, 1884-1885. Corradi, N., Kuhn, G., Sanders, I.R., 2004. Monophyly of beta-tubulin and H+-ATPase gene variants in Glomus intraradices: consequences for molecular evolutionary studies of AM fungal genes. Fungal Genetics and Biology 41, 262-273. Fortin, J.A., Becard, G., Declerck, S., Dalpe, Y., St, A.M., Coughlan, A.P., Piche, Y., 2002. Arbuscular mycorrhiza on root-organ cultures. Canadian Journal of Botany 80, 1-20. Gehrig, H., Schüßler, A., Kluge, M., 1996. Geosiphon pyriforme, a fungus forming endocytobiosis with Nostoc (Cyanobacteria) is an ancestral member of the glomales: Evidence by SSU rRNA analysis. Journal of Molecular Evolution 43, 71-81. Gerdemann, J.W., Trappe, J.M., 1974. Endogonaceae in the Pacific Northwest. Mycologia Memoirs 5, 1-76. Gianinazzi-Pearson,. V , Brechenmacher, L . 2004. Functional genomics of arbuscular mycorrhiza: decoding the symbiotic cell programme. Canadian Journal of Botany 82, 1228-1234. Helgason, T., Daniell, T.J., Husband, R., Fitter, A.H., Young, J.P.W., 1998. Ploughing up the wood-wide web? Nature 394, 431. Helgason, T., Fitter, A.H., Young, J.P.W., 1999. Molecular diversity of arbuscular mycorrhizal fungi colonising Hyacinthoides non-scripta (bluebell) in a seminatural woodland. Molecular Ecology 8, 659-666. Helgason, T., Watson, I.J., Young, J.P.W., 2003. Phylogeny of the Glomerales and Diversisporales (Fungi: Glomeromycota) from actin and elongation factor 1-alpha sequences. FEMS Microbiology Letters 229, 127-132. Hendrix, J.W., Jones, K.J., Nesmith, W.C., 1992. Control of Pathogenic Mycorrhizal Fungi in Maintenance of Soil Productivity by Crop-Rotation. Journal of Production Agriculture 5, 383-386.Hijri, M., Redecker, D., Macdonald-Comber Petetot, J.A., Voigt, K., Wöstemeyer, J., Sanders, I.R., 2002. Identification and isolation of two Ascomycete fungi from spores of the arbuscular mycorrhizal fungus Scutellospora. Applied and Environmental Microbiology 68, 4567-4573.Hijri, M., Sanders, I.R., 2005. Low gene copy number shows that arbuscular mycorrhizal fungi inherit genetically different nuclei. Nature 433, 160-163. Kuhn, G., Hijri, M., Sanders, I.R., 2001. Evidence for the evolution of multiple genomes in arbuscular mycorrhizal fungi. Nature 414, 745-748. Morton, J.B., 1988. Taxonomy of VA mycorrhizal fungi: Classification, nomenclature, and identification. Mycotaxon 32, 267-324. Morton, J.B., Benny, G.L., 1990. Revised classification of arbuscular mycorrhizal fungi (Zygomycetes): A new order Glomales, two new suborders Glomineae and Gigasporineae and two new families Acaulosporaceae and Gigasporaceae with an emendation of Glomaceae. Mycotaxon 37, 471-491. Morton, J.B., Bever, J.D., Pfleger, F.L., 1997. Taxonomy of Acaulospora gerdemannii and Glomus leptotichum, synanamorphs of an arbuscular mycorrhizal fungus in Glomales. Mycological Research 101, 625-631. Morton, J.B., Redecker, D., 2001. Two new families of Glomales, Archaeosporaceae and Paraglomaceae, with two new genera Archaeospora and Paraglomus, based on concordant molecular and morphological characters. Mycologia 93, 181-195. Oehl, F., Sieverding, E., 2004. Pacispora, a new vesicular arbuscular mycorrhizal fungal genus in the Glomeromycetes. Journal of Applied Botany 78, 72-82. Pawlowska, T., Taylor, J.W., 2004. Organization of genetic variation in individuals of arbuscular mycorrhizal fungi. Nature 427, 733-737. Pirozynski, K.A., Malloch, D.W., 1975. The origin of land plants: a matter of mycotropism. BioSystems 6, 153-164. Redecker, D., Kodner, R., Graham, L.E., 2000a. Glomalean fungi from the Ordovician. Science 289, 1920-1921. Redecker, D., Morton, J.B., Bruns, T.D., 2000b. Ancestral lineages of arbuscular mycorrhizal fungi (Glomales). Molecular Phylogenetics and Evolution 14, 276-284. Redecker, D., Morton, J.B., Bruns, T.D., 2000c. Molecular phylogeny of the arbuscular mycorrhizal fungi Glomus sinuosum and Sclerocystis coremioides. Mycologia 92, 282-285. Remy, W., Taylor, T.N., Hass, H., Kerp, H., 1994. Four hundred-million-year-old vesicular arbuscular mycorrhizae. Proceedings of the National Academy of Sciences of the United States of America 91, 11841-11843. Schüßler, A., Mollenhauer, D., Schnepf, E., Kluge, M., 1994. Geosiphon pyriforme, an endosymbiotic association of fungus and cyanobacteria - The spore structure resembles that of arbuscular mycorrhizal (AM) fungi. Botanica Acta 107, 36-45. Schüßler, A., Schwarzott, D., Walker, C., 2001. A new fungal phylum, the Glomeromycota: phylogeny and evolution. Mycological Research 105, 1413-1421. Schwarzott, D., Walker, C., Schüßler, A., 2001. Glomus, the largest genus of the arbuscular mycorrhizal fungi (Glomales), is non-monophyletic. Molecular Phylogenetics and Evolution 21, 190-197. Sieverding, E., 1991, Vesicular-arbuscular Mycorrhiza Management. Gesellschaft für technische Zusammenarbeit, Eschborn, Germany. Simon, L., Bousquet, J., Levesque, R.C., Lalonde, M., 1993. Origin and diversification of endomycorrhizal fungi and coincidence with vascular land plants. Nature 363, 67-69. Smith, S.E., Read, D.J., 1997, Mycorrhizal symbiosis, 2nd Edition. Academic Press, London. van der Heijden, M.G.A., Klironomos, J.N., Ursic, M., Moutoglis, P., Streitwolf-Engel, R., Boller, T., Wiemken, A., Sanders, I.R., 1998. Mycorrhizal fungal diversity determines plant biodiversity, ecosystem variability and productivity. Nature 396, 69-72. Vandenkoornhuyse, P., Husband, R., Daniell, T.J., Watson, I.J., Duck, J.M., Fitter, A.H., Young, J.P.W., 2002. Arbuscular mycorrhizal community composition associated with two plant species in a grassland ecosystem. Molecular Ecology 11, 1555-1564. Walker, C., 1983. Taxonomic conceepts in the Endogonaceae: spore wall characteristics in species descriptions. Mycotaxon 18, 443-455. Walker, C., Blaszkowski, J., Schüßler, A., 2004. Gerdemannia gen. nov., a genus separated from Glomus, and Gerdemanniaceae fam. nov., a new family in the Glomeromycota. Mycological Research 108, 707-718. Walker, C., Schüßler, A., 2004. Nomenclatural clarifications and new taxa in the Glomeromycota. Mycological Research 108, in press. Spore of Glomus sp. S328 with attached hypha. 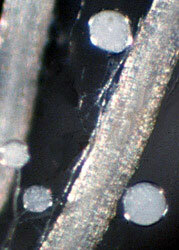 Spore diameter is approximately 80 µm. Arbuscule within a root cell, stained with Chlorazol Black E.
Roots of Plantago media (plantain) colonized with Glomus clarum. 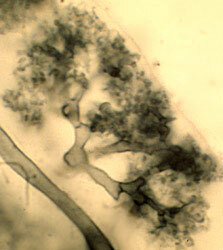 Note the hyphae and spores on the roots. I would like to thank the following persons for comments and suggestions on this page: Kerry O'Donnell, Tim James, Thomas Boller, Thorunn Helgason, Vivienne Gianinazzi-Pearson, Chris Walker, and Arthur Schüßler.